This summer is set to be another festival of football, with thirty two teams already battling it out over fifty one fixtures, across twenty three days to get their hands on the European Championship trophy – and even England have made a decent enough start and look good for the later stages of the tournament, potentially with other Home Nations in the mix too. What’s even better, is that with the tournament being held in Europe, all the live games fall within opening hours – that’s at least 3,000hrs of live football, if you discount extra time, (and the inevitable penalties England will no doubt crash out through again). Think about that: three thousand hours of live football to bring the punters in. The Euros are therefore the best possible time to have a look at your live football set-up, and see what works, what doesn’t, and how you can make changes ahead of the re-start of the Premiership season in August – and PC World Business can help you make the most out of the space you have available. PC World Business has worked with maths expert Hongshueng Dai to create a mathematical formula to help find the perfect spots in your pub to watch the beautiful game this summer. 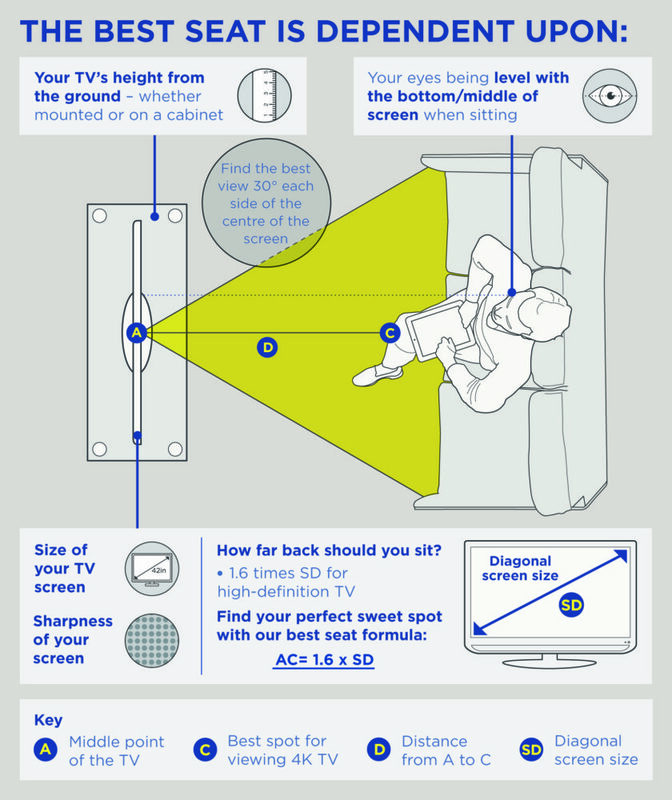 Firstly, the figures show that viewers should sit 1.6 times the screen size away from the TV. So, if you have a 44” screen, the best seats in the house will be 70.4” away. The findings also highlight that viewers should sit straight in front of the middle point of the screen for the best viewing experience, rather than from the side. And it’s not just about the distance from the TV, even something as specific as the angle can make a difference – the optimum spot to view the game from is within a 30 degree angle from the centre of the TV. For those publicans with an older TV, Hongsheung Dai advises a farther arrangement for the best experience; “For lower resolution TVs and bigger screens, viewers should consider altering the formula from 1.6x to 2.5x to ensure a perfect viewing experience”.